"Astounding. Thrilling. Amazing." --Gillian Flynn "Unputdownable." --Stephen King "A dark, twisty confection." --Ruth Ware "Absolutely gripping." --Louise Penny For readers of Gillian Flynn and Tana French comes one of the decade's most anticipated debuts, to be published in thirty-six languages around the world and already in development as a major film from Fox: a twisty, powerful Hitchcockian thriller about an agoraphobic woman who believes she witnessed a crime in a neighboring house. It isn't paranoia if it's really happening . . . Anna Fox lives alone--a recluse in her New York City home, unable to venture outside. She spends her day drinking wine (maybe too much), watching old movies, recalling happier times . . . and spying on her neighbors. Then the Russells move into the house across the way: a father, a mother, their teenage son. The perfect family. But when Anna, gazing out her window one night, sees something she shouldn't, her world begins to crumble--and its shocking secrets are laid bare. What is real? What is imagined? Who is in danger? Who is in control? In this diabolically gripping thriller, no one--and nothing--is what it seems. 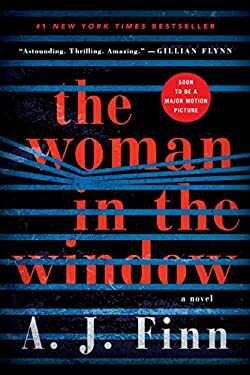 Twisty and powerful, ingenious and moving, The Woman in the Window is a smart, sophisticated novel of psychological suspense that recalls the best of Hitchcock.